1. Write the song. Usually I sit down with my guitar and let ideas flow. 2. Voice memo my song in all stages. I like listening to how my song sounds. This tells me if I need to make changes. I will then save final and good copy into my Google drive so that songs are easy to find. 3. Sing with children in my classes. I want to see their reactions and I need to see how the song works in existing tempo and form. I sometimes edit and rewrite. 4. Continue to sing and learn well and observe children’s reaction. The more I sing the song the better it sounds. This is how I get it ready for recording. It will sound like a well known song. The vocals will be confident and good. I will also know at this time what instruments I’d like to see in the recording. 5. Go into the studio. Once I have written about 10 good songs I am ready to go into the studio. 6. Studio process starts with what Chad Cummings calls scratch tracks. These are the tracks that are simply sung to set tempo and form. 7. Lay down separate real and final tracks. Guitar, vocals, harmonies, drums, piano, fiddle, banjo, mandolin, bass, sound effects, spoken parts. This has taken me anywhere from 4 months to 9 months depending on time in the studio. Usually for me once a week for a few hours. I will hire different musicians to come in and lay these tracks. Shana Aisenberg, Craig Bryan Jr., Eric Rollnick often. I also have children come in to sing on 3 tracks. That is my formula. Familiar songs or easy ones that I think children’s voices will sound nice on. 8. Mix tracks. When this is finally complete, Chad will go through each track and mix them. 9. Master tracks. Chad then goes through and masters each track. 11. Submit materials to discmakers. In 2 or 3 weeks discmakers will create CDs for me. They submit information to CD Baby. I have had a lot of satisfaction using them so this is where I stay. 12. Get CDs ordered. Discmakers sends me amount of CDs I order and some to CD Baby. CD Baby sets me up on iTunes, Amazon, Alliance Warehouse, and many different streaming sites. I go pro so that I can receive royalties for any possible purchases of my original music. 13. I then social network. Twitter and Facebook are my main social networks. I also use Linked in, Pinterest and Google plus but not nearly as often. 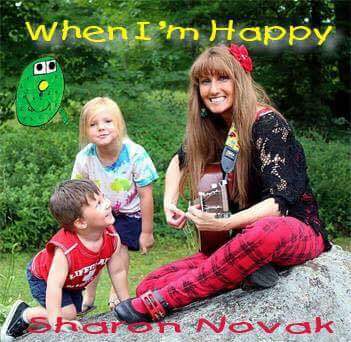 I have a website, sharonnovak.com and a Facebook page. My Facebook page is my most personal and up to date networking site. I keep my audience abreast of classes and events. 14. Copyright! I always make sure that I copyright all of my original songs. This provides extra protection not that the rule of if you write it you own it doesn’t apply, especially if I publish it on a CD. But copyrights do insure ownership and protection. Better safe than sorry. I have finished 4 CDs and have already begun writing for a sixth. Yes, the fifth will be all of my lullabies compiled into one CD. I won’t mention the shows and getting myself out there. Hahaha. This is my second job. As you can see. Lots of work. I love every minute of it. These songs are my creation and they are for the children I love so much.